I sometimes picture Les Blank as being like the doctor in a “Seinfeld” episode who describes everyone and everything he sees as “breathtaking.” More accurately, Blank trained his hand-held camera on the people and places he found breathtaking and celebrated their most vibrant, vital qualities. His twin obsessions were music and food with a pronounced, though not exclusive, fondness for the rural South. Prowling through Louisiana and Texas, Blank shot portraits of blues men Lightnin' Hopkins and Mance Lipscomb, and local Cajun musicians like Tommy Jarrell as well as various Mardi Gras street bands along with films that spotlighted the meticulous and succulent preparation of freshly caught crawfish, spicy gumbo, and other local delicacies. That you can really hear Les Blank's films is no shock, but damned if you can't taste and smell them too. Blank's playful titles alone can put a smile on your face. Who wouldn't want to watch “Yum! Yum! Yum!” or “Garlic is as Good as Ten Mothers” or “In Heaven There Is No Beer?” The latter film, released in 1984, sees Blank turning his gaze north for a change as he chronicles America's red-hot polka scene, a musical genre he had only recently come to appreciate. Though Blank was just learning about his newest passion, he adopts his usual policy of full immersion, beginning with close-ups of feet spinning on the dance floor and beer steins overflowing with suds before blasting the music: “In heaven there is no beer. That's why we drink it here.” Nonsense, of course. Les Blank's heaven is all beer; it just happens to be right here. Blank's immersion strategy reflected his belief that people (and their music and their food) are best understood in relation to their environment. 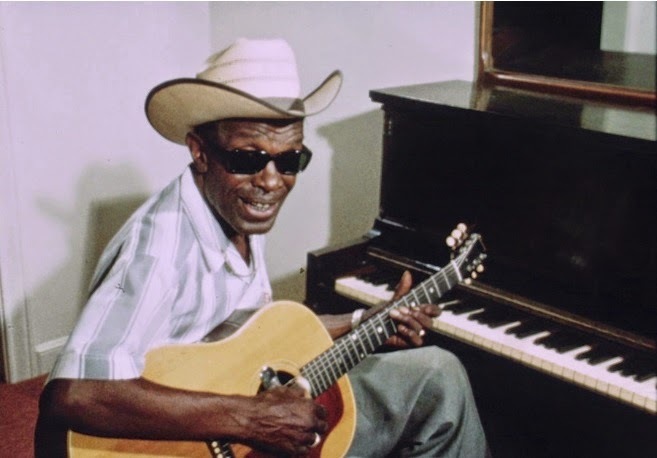 “The Blues According to Lightnin' Hopkins” (1968) was Blank's first hit (as well as the first film on this Criterion set) and it certainly spotlights the titular blues legend who turns out to be just as skilled a raconteur as a picker and singer. But the film digresses frequently for shots of Hopkins' neighbors and his neighborhood. Blank was a gifted athlete and his agile camera could catch both the perfect close-up and the most distant peripheral details, a little girl playing on a fence or a field of flowers (Blank loved flowers so much he named his company Flower Films.) Hopkins' music stands on its own but gains a special poignancy when situated in the specific context that gave birth to it. “Garlic Is As Good As Ten Mothers” (1980) does indeed focus laser-sharp on its titular fetish object, but the film features far more than just halitosis-inducing recipes. It relates the grand history of the stinking rose and the American Puritanism that led to the oppression of the magical bulb and its aficionados. Blank portrays a robust, nation-wide community of garlic lovers who will lurk silently in the shadows no more and want to share their love that dared not speak its name with every budding gourmet in the land. Garlic never smelled so sweet. 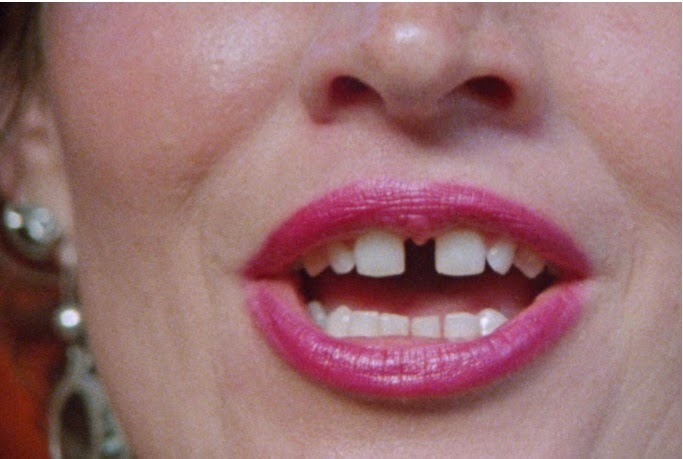 “Gap-Toothed Women” (1987) is perhaps the most inspiring of all of Blank's celebrations. You can never accuse the director of burying the lede. The title promises and the opening shots deliver: a series of extreme close-ups of gap-toothed smiles greet the viewer before expanding into a study of women of all ages and ethnicities and the supposed flaw that makes them all beautiful. From celebrities like Lauren Hutton and Sandra Day O'Connor, to little girls and senior citizens, to artists and truckers, these gap-toothed heroines share tales of insecurity and triumph, each shining under the ecstatic gaze of Blank's camera. 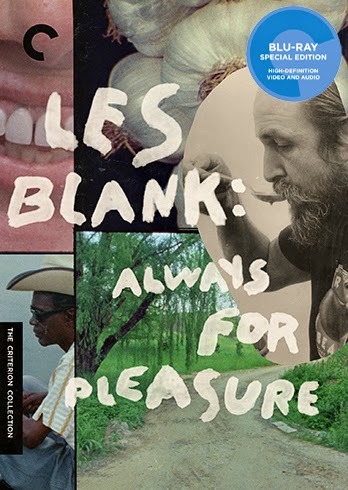 This set presents 14 films (as well as a few related shorts and a passel of extras) that cover Blank's singular career from the late '60s to the mid-2000s. It is not a complete collection of his films, most notably omitting his best know work, “Burden of Dreams” (1982), the making-of documentary about Werner Herzog's “Fitzarraldo” that exceeds its already remarkable subject in every way. That's OK. Criterion already released that on its own along with the honestly titled “Werner Herzog Eats His Shoe.” You might regret a few other omissions like “Chulas Fronteras” (1976) but considering these films have long been closely held by Flower Films, this set is pure manna for Blank's fans. 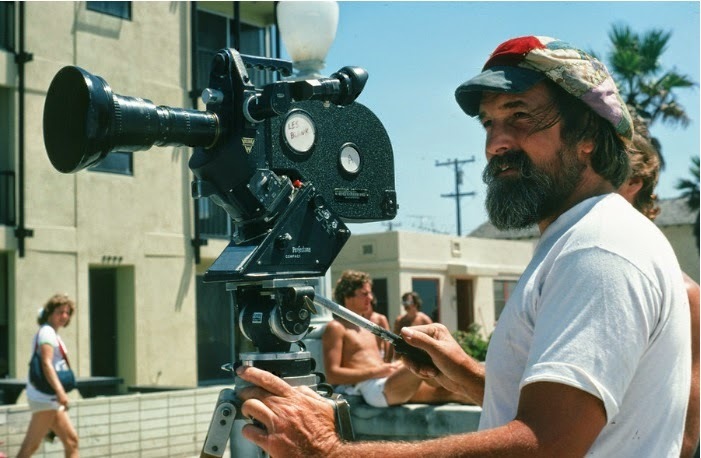 The films on the set also provide ample evidence for those (like yours truly) who claim that Les Blank belongs on the very, very short list of candidates for the title of The Great American Filmmaker. As vivid, thrilling portraits of American individuals and communities, his body of work simply has no peers. And nobody's films could ever leave you feeling any hungrier. “The Blues According to Lightnin' Hopkins” (1968, 31 min. ): Blank had already made a short documentary on Dizzy Gillespie and followed his jazz piece with a portrait of the blues legend from Houston. Hopkins' magnetic presence is the selling point, but the film is every bit as much about Les Blank, showcasing the themes, motifs and philosophy that would define his career for the next 40+ years. “Spend It All” (1971, 43 min. ): Les Blank spent plenty of time documenting Cajun music and culture in Louisiana, but perhaps never more brilliantly than here. This is an ode to the history and vitality of the Cajun people although we do learn a nasty secret: one of them uses Hunt's Tomato Paste in his cooking. Great music, great food, and a very pragmatic party-goer who pulls out his own tooth before cracking open a cold beer. Warning: One or two animals start out being alive and wind up being dinner. “A Well Spent Life” (1971, 44 min. ): It's difficult to pick the most unforgettable Les Blank subject, but Mance Lipscomb is in the running. 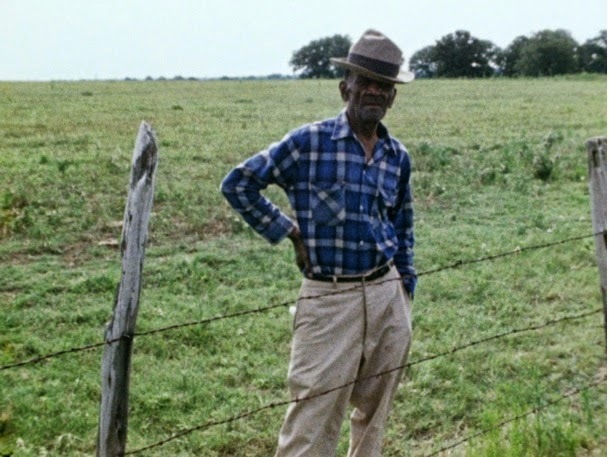 Lipscomb identifies himself as a sharecropper and speaks about the extraordinary struggles he's faced over 70+ years in Texas. It's not until halfway in that Blank even makes it clear that Lipscomb is also a very accomplished blues musician. 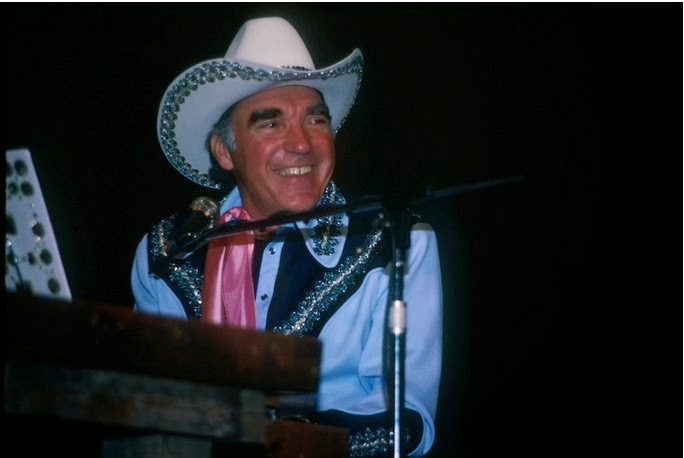 Perhaps the structure of the film reflects the fact that though Lipscomb was playing music his whole life, he didn't record his first album until he was in his sixties. And he might not even be the most interesting Lipscomb in the film as wife Elnora absolutely steals the show. “Dry Wood” (1973, 37 min. ): Blank takes a look at Mardi Gras, not as frequently depicted on Bourbon Street but in rural Louisiana with many less-familiar and thoroughly riveting images and people. Lots of Zydeco and, yes, plenty of food. “Hot Pepper” (1973, 54 min. ): Shot at about the same time and place as “Dry Wood,” this focuses on renowned Zydeco musician Clifton Chenier. Chenier, a savvy professional who controls his image tightly, remains a bit more distant than most of Blank's subjects, but the camera gets a lot closer to many of the townsfolk ('round about Lafayette, LA) talking about life. “Always For Pleasure” (1978, 57 min. ): After spending so much time in Louisiana, Blank finally enters the heart of New Orleans, starting off with images of the many barges steaming into town every day and expanding to a multi-cultural portrait of a city that loves parades almost as much as it loves food and music. What a coincidence that Blank feels the same way. We see a more familiar view of Mardi Gras revelers here, but far more interesting are the scenes of the second-line bands who play at the raucous funeral processions that bop through the city streets. 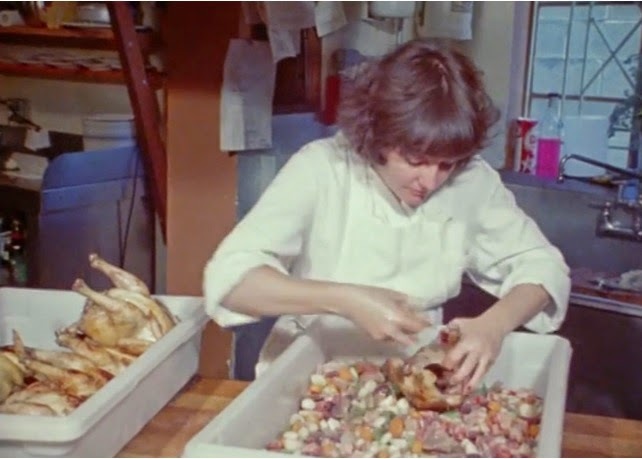 When the film screened at some locations, Blank would prepare red beans and rice (as seen in the movie) and walk up and down the aisles making sure the audience got a strong whiff of what they were watching. He called it “Smell-Around” and it sounds truly awesome. “Garlic is as Good As Ten Mothers” (1980, 50 min. ): Possibly my favorite film on the set for reasons I've already explained above. Blank argues quite convincingly that various garlic festivals and feasts are an act of resistance against the blandness of American food and culture. It may be his most sensual film, and that's saying plenty. “Sprout Wings and Fly” (1983, 30 min. ): North Carolina fiddler Tommy Jarrell is the kind of man who can tell a story about a relative who cut his toe off with a wood chisel and a friend who got drunk and was accidentally run over by an oxcart and make them sound even funnier than they already do. He also plays one mean fiddle. “In Heaven There Is No Beer?” (1984, 49 min. ): Shirtless old men cavort on the beach, couples stomp across the dance floor, and Polish-Americans brim over with pride like suds pouring over the sides of a beer stein. That's the power of polka happiness which has taken over this nation and, indeed, thrives only in America despite originating in Europe. This is a long way from Lightnin' Hopkins but the music is every bit as thrilling. If this movie doesn't make you smile, then you just need more polka. You may also finally learn who stole the kishka. “Gap-Toothed Women” (1987, 31 min): Speaking of smiles, no film has ever shown so many radiant ones. Today we have an awful lot of bad ideas about building unjustified self-esteem. This movie was the real affirming deal. “The Maestro: King of the Cowboy Artists” (1994, 53 min. ): Art is a religion, not a business. That's one of the credos of Gerald Gaxiola who takes great pride in the fact that he's never sold any of his paintings though it's not immediately clear who would be buying. Gaxiola calls himself The Maestro and stages Maestro Days where he invites California audiences to watch him do his “quick draw” paintings and other variety acts while decked out in rhinestone-studded suits he sewed himself. Though he claims to have no interest in the commercial side of art, he has eagerly pitted himself against the likes of Andy Warhol (Andy was so intimidated by the Maestro's personal challenge he just upped and died) and Christo in an effort to score his fifteen minutes plus. I'm not sure Blank quite knew what he thought of The Maestro, only that he makes for one heck of a movie star. “Sworn To The Drum” (1995, 34 min. ): This last film on the set is the only one that doesn't feel like a quintessentially Les Blank film. A tribute to Afro-Cuban drummer Francisco Aguabella, this feels more like a generic music documentary though it's possible my lack of enthusiasm is related to my relative disinterest in the musical genre. But you do get brief cameos from Dizzy Gillespie and Carlos Santana. The films are all presented in their original 1.33:1 aspect ratios. Most were shot on 16 mm film and the grainy look is well-preserved and looking generally fantastic in high-definition 2K resolution. As you would expect the image detail isn't as razor sharp as some other Criterion 1080p transfers, but I never thought I'd see Blank's films looking so good. Very little damage is visible in any of the films. The linear PCM mono tracks for all films except “Sworn to the Drum” (which gets a stereo track) sound pretty wonderful. Not a lot of dynamic sound here but there's not really supposed to be. The music sounds great, the dialogue mostly clearly mixed though you will need the optional English subtitles to help with some of the dialects; some films have subtitles built into the prints as well. Criterion has really worked overtime on this set, providing at least one extra for each of the main fourteen films on the set. Blank didn't make his films alone and these extras feature several of his collaborators, including long-time filmmaking partner Maureen Gosling. The extras are discussed by film below. don't think you need to have been born in Bavaria to have the same experience. distributed albums by many blues performers. Blank's sons Harrod and Beau are also interviewed. without its own extra attached. which was compiled by Blank and Gosling in 2006. Blank just couldn't get enough of New Orleans. which talks about Blank's athleticism and his “smell-around” screening strategy. dose to a meal during the course of the day. Film Festival and major Blank booster, to reminisce about their friendship with the director. depression. Apparently polka helped him over a rough patch. Blank's relationship with Marc Savoy who appeared in multiple films. that The Maestro has not become a famous artist. The square-bound 56-page booklet features a capsule on each film and wraps with a comprehensive overview of Blank's career by screenwriter and film professor Andrew Horton. When Les Blank died in early 2013, I staged my own memorial on Facebook. It was a little hard to find material because Blank's films have been closely held by Flower Films, with only “Burden of Dreams” widely available. Now we have a huge chunk of his career available for home viewing. If my review is a few weeks past street date, it's because there's a lot of material and I vowed to watch every single minute of it (extras and all) before writing it up. I regret nothing. You know what's better than a Les Blank film? Fourteen Les Blank films. Let me end with an easy pull quote. This is the Blu-ray release of the year.